"Real planes, real shotguns and real carnage!" 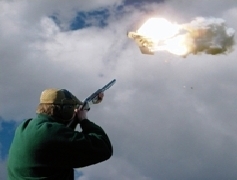 - that's what you get if you book in the ATS Gnats Shooting System. 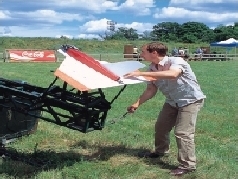 Many military organisations use similar techniques and equipment to provide targets for anti-aircraft training, but why should they have all the fun? Here's how it works: a highly manoeverable, radio-controlled drone plane is launched and flies into view of the guns, twisting and turning across the sky at anything up to 120mph. That's your target! You'll find a moving aircraft is far from easy to hit, but if you tag one of the ten pyrotechnic charges fixed to the plane you'll certainly know you've done some damage.photo shows a shotgun being used to blast model plane in sky If you can set off three charges with one shot you'll probably see your target fall - and with a direct hit you'll turn the aircraft into an exploding ball of fire. If you don't down the plane within the time limit, it survives to fly again. ATS brings a consignment of 20 flying targets along and every one of them is there to be shot at, so if you want to provide a thrilling challenge that even experienced shooters may not have tried before, the Gnats Shooting System is what you need. Anyone who knows a golfer will be aware that they don't always like to be away from their clubs for very long - especially at the weekend! 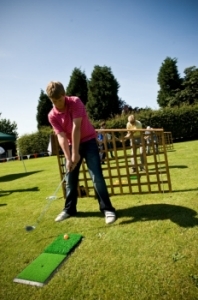 Target golf is a great way to let those who can swing a sand wedge properly show off their skills, and also gives the non-golfers a chance to have a go. The aim of the game is simple: just chip as many golf balls into the target zone as accurately as you can. Whoever gets most points wins, but anyone who takes it too seriously loses. This an activity with a broad spectrum of appeal, a great option for family events but also good for corporate occasions. Please remember that the range of possible activities we can arrange for you is huge, and by no means limited to those described above.